Waiting for the winner to be announced on M! 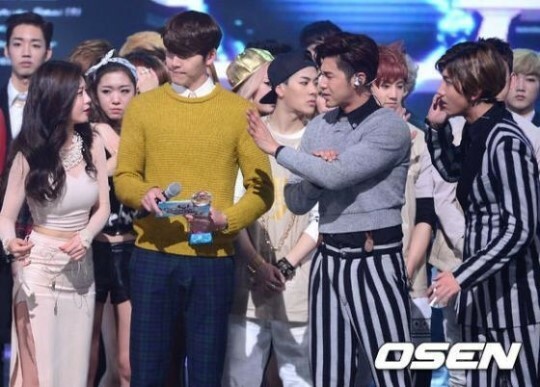 Countdown, the members of TVXQ are asking about the welfare of Girls Day’s Haeri. From left to right is Girls Day’s Sojin, M! Countdown MC Kim Woo Bin, and TVXQ’s U-KNow Yunho and Max Changmin. With Girls Day’s Haeri (20) fainting right after her performance on Mnet’s ‘M! Countdown’ on the 16th, the response from TVXQ’s U-Know Yunho (28) and Max Changmin (26) has become a hot topic. On this day, online community threads were flooded with posts by fans who were present at the recording of ‘M! Countdown’ when Haeri fainted. Meanwhile, first place went to TVXQ’s ‘Something’. ← [TRANS] 140116 [SM] Thank You So Very Very Very~~ Much!